APHA Spectro 3810 transmittance spectrophotometer is specially designed for measuring the material transmittance, absorbance, concentration, chromaticity and other datas. We analyze the spectra of the polymer sample by following ASTM methods: D3677, D 2124, D 2238, D 2702, D 5477, D 5576, D 5594, and D 5670, D 6248. We are willingly instrumental in providing to our client reliable Spectro AnalysisService. Extensively rendered to our patrons on time, these services are completed by most adroit and experienced workforces of our team. Additionally, our cost-effectiveness and ability to outfit changing patrons’ necessities make us a desired choice. Chemical composition of Fe base sample. We are the leading service provider of Spectro Analysis. 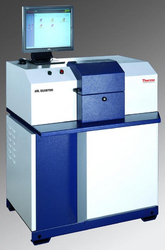 All steel, cast iron, aluminum & its alloys and copper & its alloys by spectro-analysis on optical emission spectrometer.